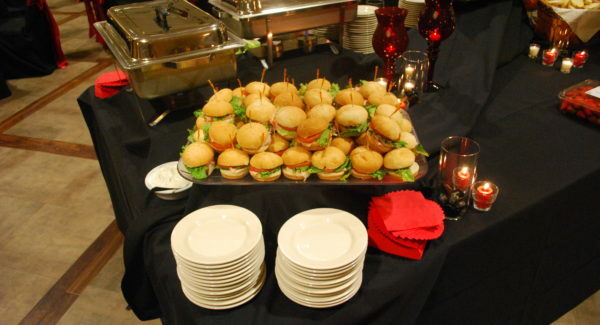 Click here to view our off-site catering menu. A $100.00 non refundable cash or check deposit is required to secure a date for off-site catering service on a Sunday through Friday. 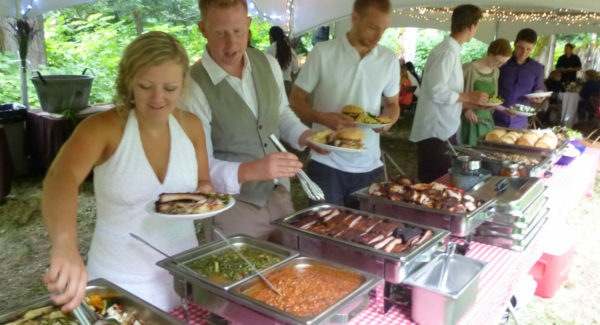 A $250.00 non refundable cash or check deposit is required to secure a date for off-site catering service on a Saturday. The $100.00/$250.00 will be applied to the final bill the date of the event. We require a minimum of 30 people for an off-site catered event. 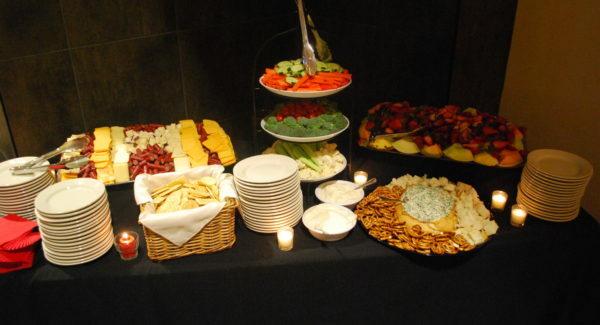 All buffets include disposable plates, napkins, utensils and cups. You may upgrade to disposable heavy duty plastic plates, linen feel napkins, “metallic” utensils and plastic cups for $2.00 per guest. 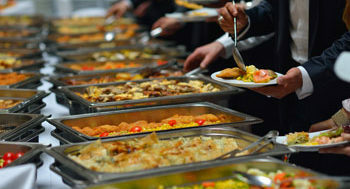 We require to 8 foot banquet tables (or 16 feet of serving area) to set up the buffet. We will provide all necessary chafing dishes, serving bowls, serving utensils and linens for the buffet table. We require access to electricity and water. All menu prices are subject to 18% gratuity and 5.5% Wisconsin State Sales Tax. Travel charges will be added for locations outside of Sheboygan County. Amore catering staff will assist in clearing tables after meal service is completed. Cancellation policy: The $100.00/$250.00 deposit is non-refundable unless you cancel or change your event date within 48 hours. If you cancel less than 3 days prior to your event you will be billed for 20% of the estimated bill/guest count. We look forward to serving you and making your event a success! 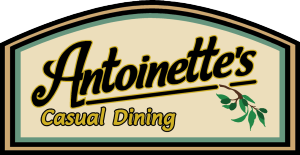 "The facility worked wonderfully for us: it was an almost ideal size and layout; the services offered were excellent; it had many helpful features - including Antonio's next door; the food was wonderful and working with the banquet coordinator to help make it all happen was easy - and a rare treat! We would absolutely hold another event at Amore; we'd be happy to recommend Amore to other business customers." "Thank you all so much for everything you did to make our day so special. Without all you, we could never have had such a beautiful and well organized wedding reception! All of your help and dedication will never be forgotten! Thank you again!" "We loved our luncheon. The food was delicious, the service excellent and the management easy to work with. From all of us, thank you so much for everything!" "Our wedding was spectacular to say the least. We decided on an appetizer buffet including over 30 different foods / munchies. Amore delivered beyond our expectations and we thank you! Your staff and banquet manager made this easy, fun, stress free and memorable. Cheers!" "Just a note to thank you for the use of your beautiful banquet facility and all the help given to us during the benefit. We appreciate all you've done." "Everything you did completed our celebration... Thank you!" "We want to thank you and Amore for the professional way in which our 50th anniversary party was managed to our great satisfaction. Everything was done to perfection according to, and even exceeding, our expectations." "We wanted to tell you how thankful we are for everything you did to make our day so much more special. Everything went perfectly. You really made the day stress free. We cannot express how grateful we are for everything you did for us." "Your wait staff and bartender were very efficient, patient, and kind. We will definitely recommend Amore to others and I's sure we will be back. Thank you for making our Christmas party a fun and relaxing evening."